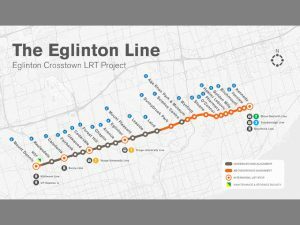 The first Bombardier Flexity Freedom LRV for Toronto’s new Eglinton Crosstown LRT arrived Tuesday, Jan. 8., on the property. 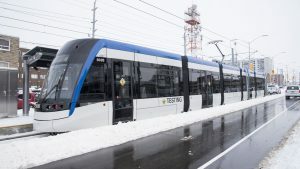 Meanwhile, delivery of the Toronto Transit Commission’s much-delayed order of Flexity Outlook LRVs has improved since the opening in 2018 of a second production line at the company’s Millhaven, Ont., plant. 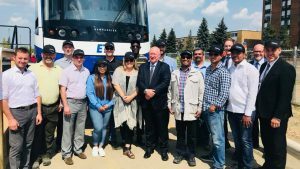 More than 3,000 Edmontonians viewed their city’s first low-floor LRV during the week of July 27 at Bonnie Doon Mall. 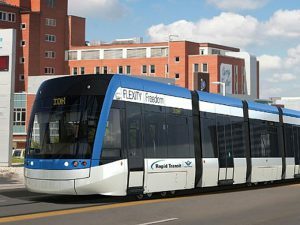 The seven-section, double-ended Bombardier Flexity Freedom car was on public display after recently arriving by CN from the Kingston, Ontario plant. It is 131 feet long with couplers folded; 137 feet with couplers out. There are 82 seats; the cars can accommodate 275 passengers. 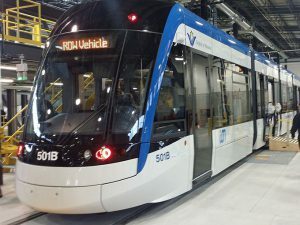 The past few years have admittedly been tough for Bombardier Transportation in North America. 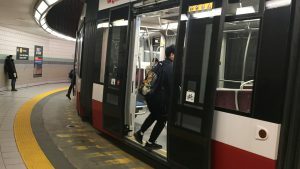 Changing dynamics—in particular, China’s entrance into the vehicle market—combined with delivery and quality problems and highly public squabbles with key Canadian and U.S. customers—have impacted the company’s business as well as its reputation. Now, however, Bombardier’s fortunes appear to be turning around. 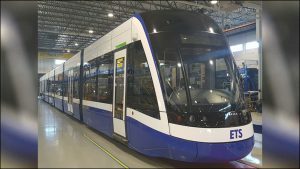 TransEd Partners, the consortium building the first phase of Edmonton’s light rail Valley Line, has released images of the first Bombardier Flexity Freedom LRV for the project. 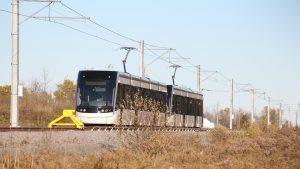 The second Bombardier Flexity Freedom LRV for the completed yet not-yet-operating Kitchener-Waterloo LRT in Ontario, Canada, was delivered to the Dutton Road storage and maintenance facility during the week of Oct. 2, 2017. 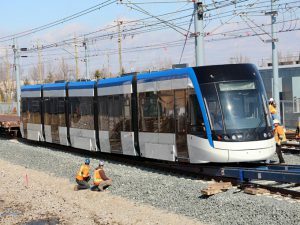 ION LRT ready to roll. Where’s the rolling stock? The LRT scene in downtown Kitchener (Ontario) in early September 2017 reminds the visitor of an episode of “The Twilight Zone”: tracks complete but rusty and debris-filled; stations ready for passengers, but none to be seen. 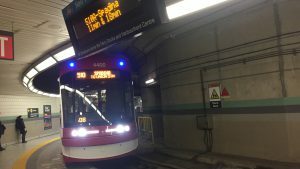 Metrolinx, the Ontario Government’s transit agency, has dropped its appeal of the court decision earlier this year that had prevented the authority from cancelling a C$770 million order with Bombardier for 182 Flexity Freedom LRVs.